Following an impressive win over Long Beach Wilson, Mira Costa’s football squad will host top-seeded South Hills Friday evening in a quarterfinal duel in the CIF-Southern Section Division 6 playoffs. Mira Costa (7-4) looks to avenge a 50-20 loss to South Hills (11-0) on Sept. 21. The Mustangs finished second in the Bay League and had little trouble defeating Wilson (6-5) 41-20 in the postseason opener despite playing with a size disadvantage on the offensive line. 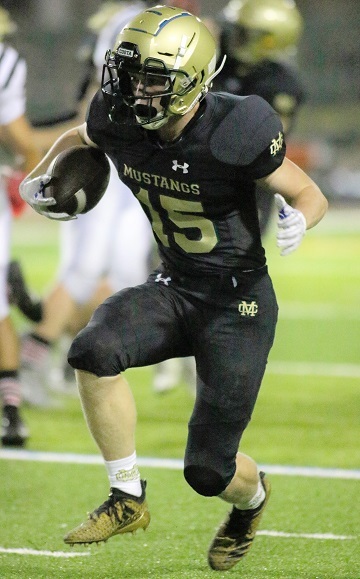 Mira Costa sophomore Richard Kick led the Mustangs with a fumble recovery and hauling in an 11-yard reception for a touchdown before his 35-yard interception return to the end zone in the fourth quarter. “We’re very excited to get by Wilson. They are a very scary team with great size and talent,” Coach Don Morrow said. “We fought hard and took advantage of any breaks that came are way. Some very timely throws by Nick (Carpino) and a good balance of the run and pass. Senior quarterback Nick Carpino tossed four passes to different receivers – Matt Harry, Kick, Eddie Burga-Donovan and Brody McKinnon – for touchdowns. Carpino completed 15 of 27 passes for 191 yards and Mira Costa’s defense recovered four Wilson fumbles, yet it was the Mustang’s offensive line who drew praise from Morrow. Usually fielding a squad of large linemen, Mira Costa’s offensive line of JB Revell (5-foot-9, 180 1bs. ), Jordan Corral (5-11, 195), Bobby Millea (6-1, 200), A.J. Oshode (5-11, 250), Tomy Undurraga (6-0, 210) and Charley Rumpp (6-1, 220) is much smaller than what Morrow is used to. Yet it outplayed Wilson’s defensive line that averaged 6-foot-3, 255 pounds. The Mustang’s focus now turns to a possible upset. In Division 4, Redondo (4-7) was no match for host Corona del Mar (9-1-1) who throttled the Sea Hawks 49-14 in the playoff opener. Freshman quarterback Kaden Martin and senior running back CJ Dietrich scored the lone touchdowns for Redondo. The Sea Kings jumped out to a 42-0 lead with 4:53 left in the first half and never looked back. PV will host Aquinas (10-1) Friday at a site yet to be determined. In Division 11, Peninsula (7-4) defeated Ontario Christian 52-28 and will play at Pomona (8-3) on Friday. In Division 5, Lawndale (8-2) shutout Dos Pueblos 35-0 and will play Antelope Valley (9-2) at a site yet to be determined. In Division 9, North Torrance edged Orange 19-16 and will host San Marino (9-1-1) on Friday. In Division 13, Bishop Montgomery (8-3) lost a heartbreaker to Garey 49-28.